An excellent way to comply with sanitary health codes and keep large, bulk food items safe and well organized, this Channel ED2454-3 three shelf heavy-duty aluminum dunnage shelving unit combines the multi-shelf versatility of a wire shelving unit with the rugged durability of a traditional dunnage rack to give you the best of both worlds! A heavy-duty, all welded, 1 1/2" extruded aluminum tubing construction n hold up to 2200 lb. and is a perfect choice for general storage and warehouse areas, or even damp environments like walk-in coolers and freezers. 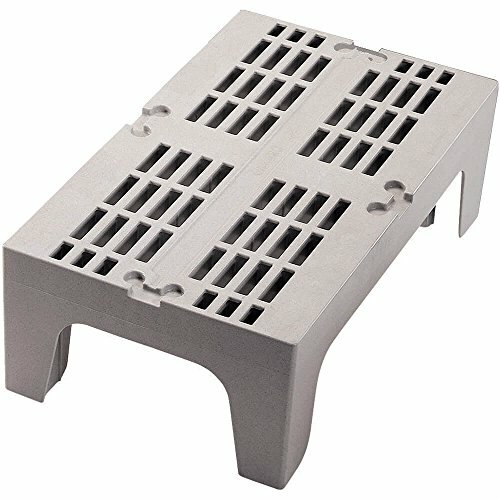 The bottom shelf is 12" off the ground so that your products are safe from liquid spills, dust, and dirt, while also promoting the circulation of air underneath to prolong product life. With 26" of space between each tubular shelf, you n be confident that you'll have plenty of room for large packages or stacks of smaller packages. This rack is shipped assembled for your convenience. 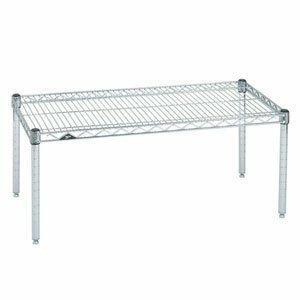 Overall Dimensions: Width: 54" Depth: 24" Height: 64"
An excellent way to comply with sanitary health codes and keep large, bulk food items safe and well organized, this Channel DR2036-3 three shelf heavy-duty aluminum dunnage shelving unit combines the multi-shelf versatility of a wire shelving unit with the rugged durability of a traditional dunnage rack to give you the best of both worlds! A heavy-duty, all welded, 1 1/2" extruded aluminum tubing construction n hold up to 2500 lb. and is a perfect choice for general storage and warehouse areas, or even damp environments like walk-in coolers and freezers. So that you know you're getting a product you n count on, it even boasts a lifetime warranty and guarantee against rust! The bottom shelf is 12" off the ground so that your products are safe from liquid spills, dust, and dirt, while also promoting the circulation of air underneath to prolong product life. With 26" of space between each shelf, you n be confident that you'll have plenty of room for large packages or stacks of smaller packages. This rack is shipped assembled for your convenience. 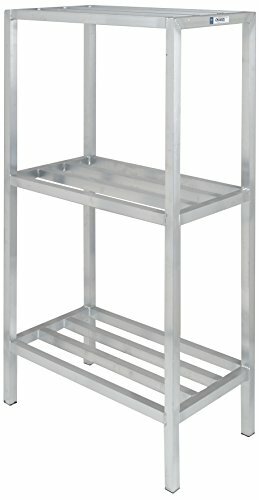 Overall Dimensions: Width: 36" Depth: 20" Height: 64"
An excellent way to comply with sanitary health codes and keep large, bulk food items safe and well organized, this Channel ED2436-3 three shelf heavy-duty aluminum dunnage shelving unit combines the multi-shelf versatility of a wire shelving unit with the rugged durability of a traditional dunnage rack to give you the best of both worlds! A heavy-duty, all welded, 1 1/2" extruded aluminum tubing construction n hold up to 2200 lb. and is a perfect choice for general storage and warehouse areas, or even damp environments like walk-in coolers and freezers. The bottom shelf is 12" off the ground so that your products are safe from liquid spills, dust, and dirt, while also promoting the circulation of air underneath to prolong product life. With 26" of space between each tubular shelf, you n be confident that you'll have plenty of room for large packages or stacks of smaller packages. This rack is shipped assembled for your convenience. 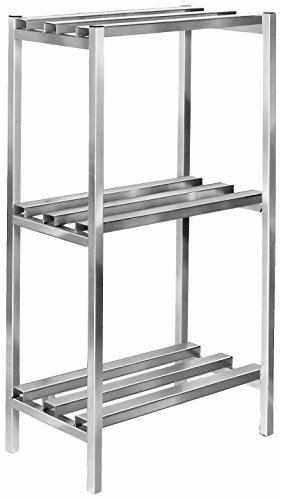 Overall Dimensions: Width: 36" Depth: 24" Height: 64"
Nexel Dunnage Shelf ● Shelf measures: 18"W x 30"L ● Clear Epoxy Finish ● Includes 1 shelf and 4 shelf clips ● 1300 lbs. capacity ● Dunnage Shelves are Constructed of 1" square steel tubing with removable wire decking ● Maintenance free construction ● Nexel's Clear Epoxy (Poly-Z-Brite) finish features a true powder epoxy over zinc chromate electro plating ● Limited 15-Year Warranty against rust and corrosion ● Features NEXGuard, an anti-microbial agent that protects the epoxy coating from bacteria, mold, and mildew that causes odors and product degradation ● NSF listed ● Open design minimizes dust accumulation while ensuring light and air circulation ● Shelves easily adjust without tools and align accurately at 1" increments ● Nexel also offers several accessories (baskets, hooks, ledges, casters, etc.) which can be purchased separately and extend the usefulness of your shelving unit ● Photos may not reflect advertised size. An excellent way to comply with sanitary health codes and keep large, bulk food items safe and well organized, this Channel DR2454-4 four shelf heavy-duty aluminum dunnage shelving unit combines the multi-shelf versatility of a wire shelving unit with the rugged durability of a traditional dunnage rack to give you the best of both worlds! A heavy-duty, all welded, 1 1/2" extruded aluminum tubing construction n hold up to 2500 lb. and is a perfect choice for general storage and warehouse areas, or even damp environments like walk-in coolers and freezers. So that you know you're getting a product you n count on, it even boasts a lifetime warranty and guarantee against rust! The bottom shelf is 12" off the ground so that your products are safe from liquid spills, dust, and dirt, while also promoting the circulation of air underneath to prolong product life. With 16 1/2" of space between each shelf, you n be confident that you'll have plenty of room for large packages or stacks of smaller packages. This rack is shipped assembled for your convenience. 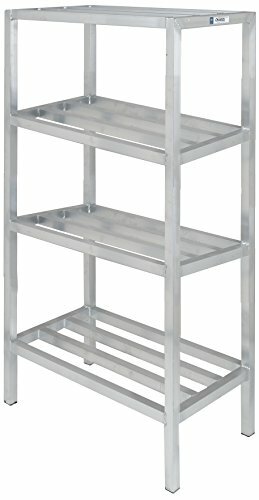 Overall Dimensions: Width: 54" Depth: 24" Height: 64"
An excellent way to comply with sanitary health codes and keep large, bulk food items safe and well organized, this Channel ED2460-4 four shelf heavy-duty aluminum dunnage shelving unit combines the multi-shelf versatility of a wire shelving unit with the rugged durability of a traditional dunnage rack to give you the best of both worlds! A heavy-duty, all welded, 1 1/2" extruded aluminum tubing construction n hold up to 2200 lb. and is a perfect choice for general storage and warehouse areas, or even damp environments like walk-in coolers and freezers. The bottom shelf is 12" off the ground so that your products are safe from liquid spills, dust, and dirt, while also promoting the circulation of air underneath to prolong product life. With 16 1/2" of space between each tubular shelf, you n be confident that you'll have plenty of room for large packages or stacks of smaller packages. This rack is shipped assembled for your convenience. 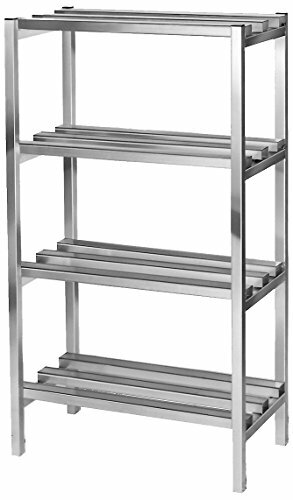 Overall Dimensions: Width: 60" Depth: 24" Height: 64"
An excellent way to comply with sanitary health codes and keep large, bulk food items safe and well organized, this Channel ED2460-3 three shelf heavy-duty aluminum dunnage shelving unit combines the multi-shelf versatility of a wire shelving unit with the rugged durability of a traditional dunnage rack to give you the best of both worlds! A heavy-duty, all welded, 1 1/2" extruded aluminum tubing construction n hold up to 2200 lb. and is a perfect choice for general storage and warehouse areas, or even damp environments like walk-in coolers and freezers. The bottom shelf is 12" off the ground so that your products are safe from liquid spills, dust, and dirt, while also promoting the circulation of air underneath to prolong product life. With 26" of space between each tubular shelf, you n be confident that you'll have plenty of room for large packages or stacks of smaller packages. This rack is shipped assembled for your convenience. Overall Dimensions: Width: 60" Depth: 24" Height: 64"
An excellent way to comply with sanitary health codes and keep large, bulk food items safe and well organized, this Channel ED2454-4 four shelf heavy-duty aluminum dunnage shelving unit combines the multi-shelf versatility of a wire shelving unit with the rugged durability of a traditional dunnage rack to give you the best of both worlds! A heavy-duty, all welded, 1 1/2" extruded aluminum tubing construction n hold up to 2200 lb. and is a perfect choice for general storage and warehouse areas, or even damp environments like walk-in coolers and freezers. The bottom shelf is 12" off the ground so that your products are safe from liquid spills, dust, and dirt, while also promoting the circulation of air underneath to prolong product life. With 16 1/2" of space between each tubular shelf, you n be confident that you'll have plenty of room for large packages or stacks of smaller packages. This rack is shipped assembled for your convenience. Overall Dimensions: Width: 54" Depth: 24" Height: 64"